multilingual simultaneously speech transltion. The process of translation can take as fast as 300 milliseconds with an accuracy rate up to 97%. It just like a private interpreter for transnational travel, study, business and social communication. Android 7.0 provides you with an opportunity to enjoy some fresh functions such as app authorization managements. Google Now on Tap, Doze Mode for the battery and other tweaks that greatly improve the user experience. MT6580A Quad-core 1.3GHZ plus Android 7.0 to make your phone running fast and safety while playing heavy-load games and HD video. 8GB ROM and 1GB RAM stores more apps you like and makes user experience on performance more comfortable. Equipped with Microsoft voice technology; understand of natural language and mechanical translating. Moreover, Microsoft advanced technology ensures more accurate result as it can self-correct. Built-in 850mAh large capacity battery, it could support 8-hour continuous translating and equipped with low consumption chip set. It supports 7-day standby. Without worrying your capacity, your trip would be much more wonderful. Produce a real-person-like dialogue. Suitable for conference, exhibitions, parties and other noisy occasions. It can be used to communicate face to face and solve communication obstacles, fast response in seconds. 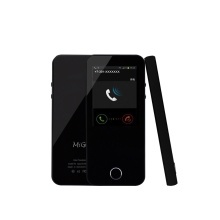 You can make phone calls through this device after NANO SIM card is inserted.